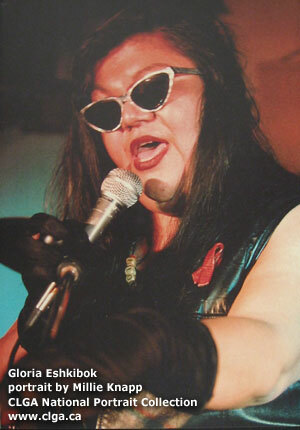 Gloria May Eshkibok is a two-spirited indigenous actor, singer and community activist, from Wikwemikong Unceded Territory, Manitoulin Island. She has performed in both theatre and film, is the lead singer of the Unceded Band, and sings with the Sweetgrass City Singers. “Two-spirted,” references to a person who has both a masculine and feminine spirit, and is a term used by some indigenous people to describe their gender, sexual, and/or spiritual identity. “The elders say that the circle is incomplete without the Two-Spirited community.” – Gloria Eshkibok. Gloria was also a victim of the 60s Scoop (a practice that occurred in Canada where indigenous children were “scooped up” from their families/communities and placed in foster homes or adoption), of which she often speaks of her experiences. Gloria was an honoured presenter at York’s International Women’s Day in 2000.